By spray-painting glass, you can get it to look better than ever. There are several manufacturers of spray paint for glass out there and you may get confused trying to shuffle between them to come up with the right choice. Well, that’s the reason for this post. To show you the best spray paint for glass in 2017! There are a few things to look out for when purchasing spray paints. This is an important factor to consider as it can be annoying having to repaint an item over again just a few weeks later. Although it is possible to add one or two layers of a coating during painting, a quality spray paint offers optimum thickness at one go. The optimum time it takes for glass paint to dry and become touchable is between 5 and 10 minutes. Some paints, however, take longer to dry and while this may not be a problem to a lot of people, it can be irritating to some. A lot of people put “brand” into consideration when searching for quality products and this is just natural. There is always that feeling that a recognized brand will outperform its competitors in quality. The Krylon brand is one which is highly recognized in the spray painting industry and their interior/exterior enamel spray paint is definitely a product I recommend you go with. The process for spray painting glass is quite different from plastic and this is because plastic is a nonporous material. Do not just start spraying glass or else, it may not stick and you’ll find yourself having to repeat the process after a few days. Before you start painting, you need to wash thoroughly with mild soap and clean with a soft towel. This is to wipe off all grime and greasy substances from the glass. You also need to use fine sandpaper to rub on the glass to remove small bumps or residue that may be stuck. Don’t press hard so as not to scratch the glass surface though. Alright, now that you are through with the pre-painting exercise, follow the few steps laid down below to paint your glass. Get a piece of carton and place it on a flat surface. This is to prevent the paint from spilling on the floor or table. You should also mark out areas of the glass where you don’t want the paint to touch with a masking tape or something similar. Every spray can have a direction for painting and could vary from one another. You are generally required to shake the can thoroughly before starting, and in-between applications. However, you should take a few minutes to read through the body of the can to see if there are additional directions for use. After shaking properly, start by spraying a light thin layer of paint on the object until it is fully covered. Allow it to dry for a few minutes. Repeat the process once or twice depending on the strength of the paint so as not to over paint. Allow some minutes for the object to dry properly before touching it. If you are looking for the best spray paint for glass then look no further than the Krylon Enamel spray paint. A fast drying, high-solids formula ensures excellent coating capable of lasting long no matter where the object is to be placed. Be it under your roof, in the rain or sun, Krylon spray paint leaves your plastics and glasses shining and more presentable. The price ranges between $5 and $10 which is neither too cheap nor expensive by my standards. Check out some key features below. Check out some key features below. The Kryler spray paint comes in various exciting colors including those that are not so popular, allowing you blend your plastics and glasses into your desired color. A spray paint that takes too long to dry can be annoying. The Krylon spray paint doesn’t take more than 10 minutes to dry to the touch. You can, therefore, have your full spraying session in less than 30 minutes and enjoy other activities. 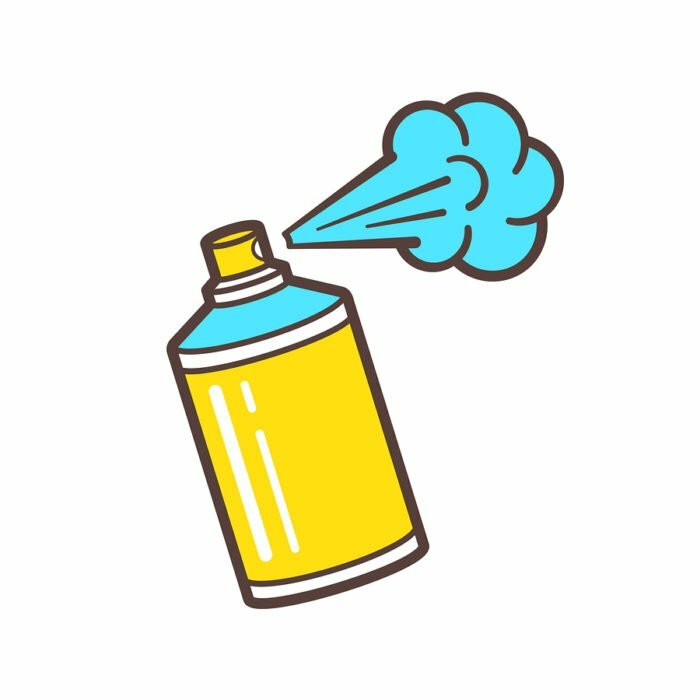 The conventional spray can have its spray tip-focused in one direction. Krylon features a new dial technology which rotates while in use. As a result, painting is now faster and easier than what it used to be. No matter how good a product is, there is bound to be a few flaws. But as long as the flaws are kept to the barest minimum, it should not have an impact on your decision. The most significant con on this product is its cost. A few people have claimed that it is more expensive when compared to others in its category. Well, it is a normal thing for a quality product to be expensive as long as it doesn’t go beyond a reasonable range. First off, the time it takes this paint to dry is one feature that is worth talking about over and over again. In fact, there are a lot of positive reviews from consumers just for this reason alone. It’s 360-degree dial spray also has its own bit of advantage even though consumers are not really crazy over it. The spray area is not too wide making it easy for you to focus your painting on a particular area without wastage. This allows you maximize the contents of the can for several painting projects. Although this review focuses on glass spray-painting, the Krylon enamel spray paint can be used to spray other objects including wood, wicker, paper craft, and metal. The Krylon color master is obviously one of the best spray paint for glass. It’s got all the features needed to transform the looks of most objects in your home. It has also got a host of positive reviews which proves its pedigree in the spray paint industry. SO, you’re obviously paid by Krylon, and this is obviously an ad masquerading as a ‘review’. I like Krylon, but this kind of BS is pathetically transparent. Maybe don’t lay it on so thick next time.